It’s baaack. It has been 4 years since a polar vortex disruption brought artic weather to the Northern Hemisphere. In the 2014-2015 winter, it meant historically cold temperatures and high snowfall in many areas. While a polar vortex (a large area of low pressure and cold air that surrounds both of the Earth’s poles) always exits, other weather conditions can disrupt it and cause its effect to spread. 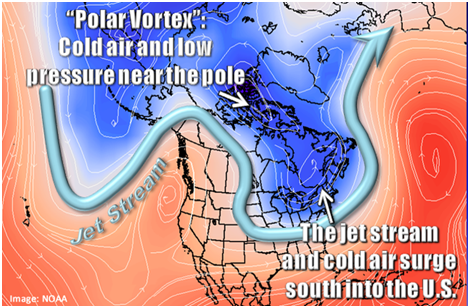 Normally, the counter-clockwise (vortex) airflow keeps the colder air near the pole. The disruption is detected by pressure measurements in the stratosphere – not a ground level. While, a variety of pressure levels are used to mark its position, the 50 mb pressure surface is most often used to identify its location. Welcome to All Sensors “Put the Pressure on Us” blog. This blog brings out pressure sensor aspects in a variety of applications inspired by headlines, consumer and industry requirements, market research, government activities and you. In this blog we’ll be discussing the pressure in water and oil. And don’t forget to check the tire pressure, too. A little over 50 years ago these were commonly used in the predecessors to today’s gas stations – service stations. 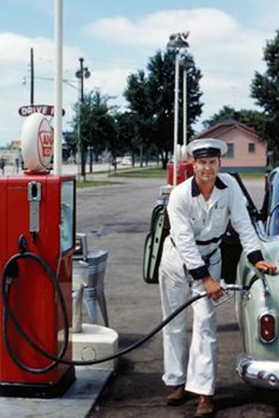 In addition to pumping gas, the service station attendant would perform routine but often mandatory measurements. In those days, the reliability of vehicles would frequently require adding water, oil and air. Vehicle reliability has improved significantly since then. With today’s rugged and affordable sensors for pressure and other parameters, these and other measurements are performed continuously – the vehicle provides the service of monitoring itself for the driver and mechanics. Common pressure sensor measurements in modern vehicles include engine oil pressure, tire pressure, side airbag pressure in crash detection systems, manifold absolute pressure, barometric pressure, seat occupancy pressure and more. Do you have a pressure sensing question? Let me know and we’ll address it in an upcoming blog. Welcome to All Sensors “Put the Pressure on Us” blog. This blog brings out pressure sensor aspects in a variety of applications inspired by headlines, consumer and industry requirements, market research, government activities and you. In this blog we’ll be discussing critical flight measurements using pressure. Amplifying the low level signal from a higher pressure range sensor for a low pressure application can frequently lead to unacceptable noise problems in the application. This can occur if the sensor supplier performs this task as part of an amplified and signal-conditioned product offering or if the customer performs the amplification and signal conditioning. The limitation is inherently in the sensor die. Specially designed lower pressure range sensors, such as All Sensors DLVR Series mini digital output pressure sensors offer a solution to the noise problem. The low mass, high-sensitivity die are less sensitive to errors due to vibration or changes in time, temperature and position. 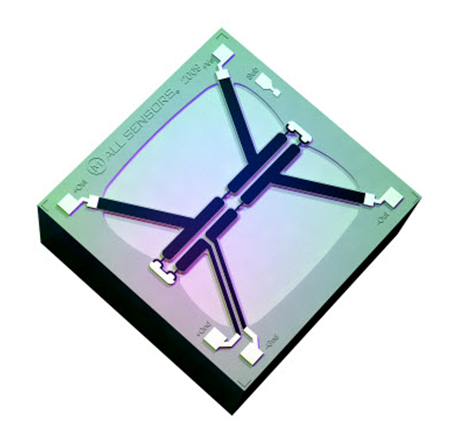 All Sensors’ CoBeam2 TM die technology achieves a high level of pressure sensitivity without using boss structures and larger die topologies commonly used in microelectromechanical system (MEMS) designs. This design approach significantly reduces gravity and vibration sensitivities. As shown in Figure 1, CoBeam2 technology combines bonded strain gage sensor insight with state of the art MEMS processing. Figure 2 shows active dual-die compensation with electrical cross coupling of the sensors’ outputs and pneumatic cross coupling of the pressure used in the DLVR Series and other All Sensor products. By performing both electrical and pneumatic cross coupling, the signal strength is not reduced and the common mode error compensation is optimized. Some products use just the electrical cross coupling. Pressure Point 4: Dual Die Compensation for MEMS Pressure Sensors provides more details. Combined with CoBeam2 Technology, the amplified, digital output sensor reduces many errors associated with pressure measurements. Figure 2 (a) Electrical cross coupling compensation of active die (Die 1) using a reference die (Die 2) and (b) pneumatic cross coupling compensation using fluidic channels in the pressure sensor package. Drones, multicopters, quadcopters, small unmanned air vehicles (UAVs) and micro air vehicles (MAVs) are not only the rage in modern flying craft, they are among the applications that can benefit from the improved sensor performance of a small form factor MEMS sensor. Low pressure sensors such as the 1 inH2O DLVR-L01D up to the 10 inH2O DLVR-L10D can be used for measuring differential pressure on the wing in multiple locations to provide improved control and stability. Higher pressure ranges are also available. Wind tunnel testing has traditionally used several pressure sensors on the wings of a test aircraft to provide a pressure-based estimation of the flow field above an airfoil. Recently, for increased control in drones, aerodynamics-based feedback using onboard active flow control schemes relies on a set of pressure measurements taken across the aircraft through pressure ports and through multi-hole probes. The aerodynamic feedback can be especially useful when switching control modes during various flight conditions. Highly turbulent situations can also pose attitude control difficulties for fixed-wing MAVs. In Bioinspired Wing-Surface Pressure Sensing for Attitude Control of Micro Air Vehicles, researchers are investigating alternate technique using pressure sensors to solve this problem. Other flight measurements can benefit from highly stable pressure sensors. For example, the DLV-015A DLV Series mini digital output absolute sensor can provide the barometer or altimeter readings in these same aircraft. CoBeam2 is a trademark of All Sensors Corporation. Welcome to All Sensors “Put the Pressure on Us” blog. This blog brings out pressure sensor aspects in a variety of applications inspired by headlines, consumer and industry requirements, market research, government activities and you. In this blog we’ll look at how pressure helps predict weather. With all the harsh winter weather occurring recently, knowing what to expect in your area is important knowledge for short term planning and, in some areas such as the northeast, for long term planning. Sensing barometric pressure was one of the earliest forecasting tools and continues to be important today. One website provides the barometric pressure history from numerous major cities in the U.S. from Friday, Feb 20 to Thursday, Feb 26. The high and low readings only tell part of the story. The intensity of the weather depends on how quickly the front develops and other factors. In stormy weather, the barometric pressure tends to be lower and a lower reading is one sign of approaching inclement weather. During fair weather, the barometric pressure is typically higher and if the pressure begins to rise, it is a sign of tranquil weather. In the U.S., the Federal government uses pressure as part of several methods available to predict weather. On Feb26, the weather in many places around the U.S. was much less severe than it had been in recent weeks with at least one exception. 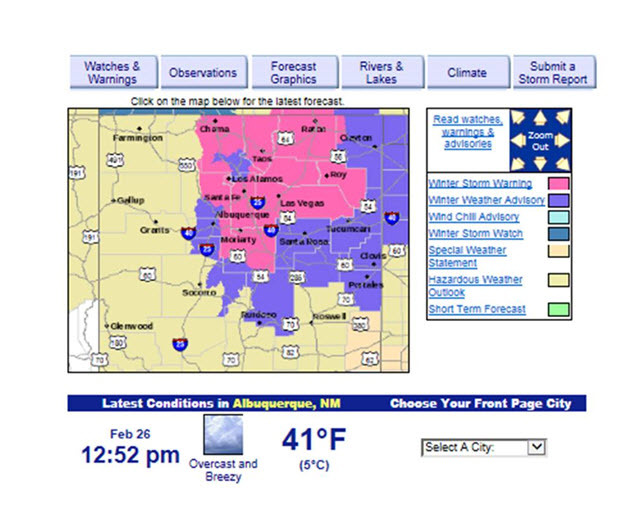 THIS HAZARDOUS WEATHER OUTLOOK IS FOR PORTIONS OF NORTH AND CENTRAL NEW MEXICO. For weather forecasting and other sensing applications, accuracy and other factors make the measurement acceptable for reliable use. That is where the expertise of the user comes into play.